Sleep deprivation is a condition that adversely affects the population and is a severe concern for many college students. For something that occurs so frequently, its effects are strong and stick with many people throughout their lives. The medical director of the Student Health Center, Lindsay Phillips, talked about some of the short-term issues with lack of sleep. Some common side effects are fatigue and irritability, lower motivation and weak immune systems. In addition, mental health and resilience can be impaired as the ability to deal with stress declines as well. According to the Division of Sleep Medicine at Havard Medical School, mood, judgement, concentration, attention to detail, memory and logical reasoning can all be compromised when a person loses sleep. "You become emotionally labile; it makes dealing with adversity, whether it be personal or academic, very difficult. With sleep, you approach situations better and you're better as problem solving," Phillips stated. Fifth year Human Centered Computing major, Clahr Clark, and fifth year Criminal Justice major, Evan Davis, both have struggled with lack of sleep. "If I haven't slept well, I find myself zoning out a lot. My handwriting is really bad; my hands are super shaky because I drink caffeine to wake myself up. Later on, I can't read my notes. I also take naps and I am very irritable," Clark said. Davis added, "I start off my day feeling fine, but by noon I get really tired." Even the ability to learn and retain information can be affected. While sleeping, memory consolidates so an individual can process all of the information that they gathered during the day. Therefore they are more likely to retain information with more sleep, leading to more academic success. “If you’re sleep deprived, you just can’t retain what you’re learning. You’re not getting the most out of your education this way. Your body goes through repair while you sleep,” said Phillips. Sleep deprivation can also increase the risk of serious accidents and injuries. Out of the three million car accidents per year in the U.S., one million of them are caused by drowsiness at the wheel, according to Visually. In extreme cases, lack of sleep can actually cause hallucinations. As far as long-term effects go, the Division of Sleep Medicine at Harvard Medical School stated sleep deprivation is closely related to both diabetes and hypertension. It can also lead to obesity, cardiovascular diseases and even lower one's life expectancy. If someone sleeps five hours or less a night, their mortality risk is raised by 15 percent. Also according to Visually, sleep deprivation can lead to higher levels of stress, increased blood pressure, long-term mood disorders, depression, anxiety and mental distress. While sleep-deprived one may also see a 45 percent increase in depressive symptoms. Does This Really Affect RIT Students? A poll taken by a random collection of 68 RIT students showed that a mere 48.6 percent of students at RIT actually get a healthy amount of sleep — that's less than half. Not all RIT students participated in the survey, but the pool ranged across numerous majors and years. The survey asked how many hours the students slept a night on average and how many late nights or all-nighters they've pulled. The students were asked in-person and at random all over campus. For those between 18 and 25 years old, a healthy amount of sleep is 7–9 hours. But only 37.8 percent of students recorded getting seven hours of sleep. Also, over half of students recorded pulling at least one late night or all-nighter so far this semester. In addition to this, 24 percent of students recorded having at least five late nights or all-nighters due to schoolwork rather than parties. This is extremely unhealthy for any human being. Is it actually reasonable to get 7–9 hours of sleep a night while being a student at? Whether or not someone can, it should at least be a priority. 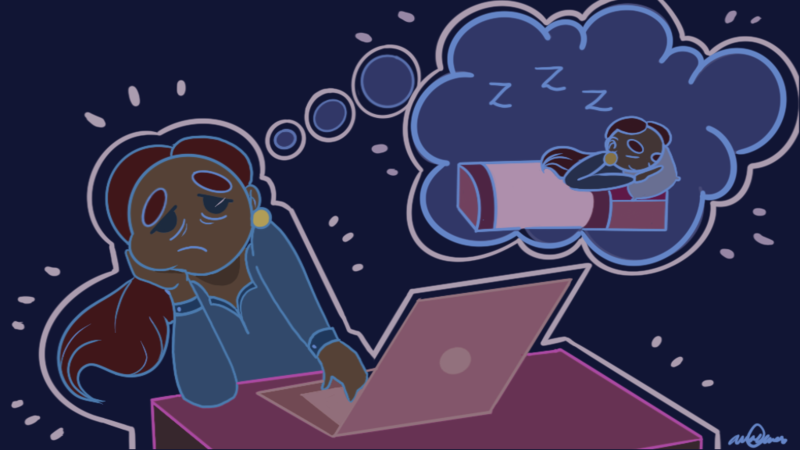 "It mostly depends upon your coursework and credit hours, but sleep should be prioritized. Homework is what keeps me up at night. It's never one particular class, it's just whatever is due the next day,” Clark said. Many people think that sleep should be the first thing to go when they’re running low on time and they need to stay up to get work done. But they are much more capable of completing the work when they are well rested. How can one prioritize things better and get the work done much more efficiently? There are many ways that someone can work to practice good sleep hygiene. The most important aspect is simply sticking to a sleep schedule. This is of course easier said than done, but going to sleep and waking up at the same time everyday is crucial. It also helps to exercise daily. It is also very important to allow a bed to be a place for sleeping. Such things as watching Netflix or doing homework should be done at a desk. Save the bed for what it was designed for, as it's important to sleep at least 85 percent of the time that is spent in a bed. “I do everything in my bed. If I could be in my bed all of the time, I would be,” Clark said. According to the National Sleep Foundation, white noise is also helpful. White noise can be provided by an air conditioner, a fan, an air purifier or anything that is a consistent and soothing background noise throughout the night. TV sounds are constantly changing in tone and volume which is not good for sleep. In addition, if a morning alarm is needed, make sure it is loud and distinct enough to wake up to. Lastly, what college students may find the most difficult, the National Sleep Foundation recommended to never use electronics that emit blue wavelengths light before bed. Cell phones, computer monitors and more, are all bad for sleep hygiene — meaning they impair ones ability to fall asleep at night. A good step is to find a program that adds a red tint to the display and it will make a huge difference. All in all, Visually states that sleep deprivation is a condition that affects more the 70 percent of the American population and it is certainly prominent at our university. Having healthy sleep can be easy if it's made a priority. Therefore, improvement on assignments, exams and mental efficiency are all a possibility.